Where do I began? I believe I did a short version of this in my first class, but I shall try to go into greater depth this time around. I can't pin point the moment my interest in herbalism first began, but I can piece together what led me to where I am now. I'll begin by saying that my spiritual beliefs and my membership within Ár nDraíocht Féin; A Druid Fellowship (ADF) play a major role in where I am going with my herbal studies. I have been a practicing Druid for going on 26 years and actually stepped on the path of earth centered spirituality at the age of 16. As long as I can remember, I have always been what I would call a nature nerd. As a kid my bookshelves and window sill was covered with leaves, twigs, pine cones, acorns, walnuts and any seeds I found. When my brothers and sister were off playing I be in the yard helping my grandfather doing the yard work or helping my grandma re-potting her plants. As a young teenager I loved to wander the Los Padres in my hometown. I had a infinity for trees and in my early 20's I joined the California Conservation Corp for a year. Then I met my mentor in Boulder, CO who first set me feet to the Druidic path. Later at 24 I got involved with EarthFirst! and was involved with the Redwood Summer rally. Around this time I begin to realized I was starting to pick up a little here and there and thought it be cool to actually learn about herbs . Over the years I continue to pick up a bit here and a bit there on herbalism. I worked on a few organic farms and started to get really interested in sustainable living and homesteading. By my mid 30's I had decided I wanted to homestead and started really researching and learning all I could. During this time I went out with a lass who was training to be a midwife and this was my first real introduction to herbalism. I had wandered through a few ICs (intentional communities) and realized that the medical field was the one area they were not looking seriously at. Oh many dabbled in kitchen herbalism, but there were very few medically trained herbalist. It was strange too. There were a lot of trained masseuses and yoga instructors and Reiki practitioners and energy workers. But medically trained herbalist were majorly lacking in numbers. Being organic farming seemed to be at the center of this whole movement I would have expected herbalist to be at the top of the list among these communities. I started studying herbalism seriously on my own. 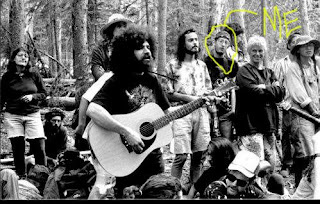 The picture above is of me at the Earthfirst Redwood Summer rally. Darryl Cherney is on guitar. My work within the environmental movement played probably the greatest role in my interest in herbalism because I studied the eco-system of the great red giants and I became fascinated by the diverse plant life that depended on them. So what do I hope to gain from this course? A deeper and better scientific understanding of herbs to compliment my spiritual understanding and relationship with them. To help not only preserve a practiced once revered among my ancestors, but also teach it to others. And to be able to offer alternative healthcare to the needy who can't normally afford it. Some who know me are probably wondering, "What about Brighid? Isn't she you matron?" Yes and no. Brighid is more like my spiritual mother. She has seen fit to foster me off to Airmid. So I am a child of Brighid, a Devotee of Airmid. It's actually a beautiful relationship, since my mother is a goddess of healing as well.